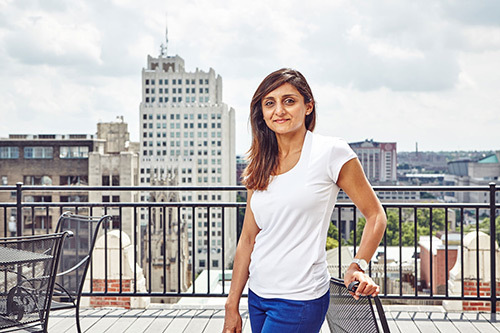 Pravina Pindoria is the founder of an award-winning software startup called Tallyfy. Pravina graduated from City University in 2004 with a BSc in Nursing Studies (Child). After graduation, she worked at London’s leading hospitals, carried out international clinical trials abroad, and trained medics in rural Africa. She explains how her entrepreneurial journey began at City University. Throughout my journey through bedside care in hospitals, working at state of the art research facilities and teaching in under resourced areas, I noticed one problem. Bureaucracy and paperwork came in the way of professionals trying do their job - caring for patients, innovating and training. All the wards, clinics and research facilities were either using badly designed software, excel sheets or paper forms repeatedly to get checks and work done. I thought there was surely a more simpler and efficient way to get repetitive tasks done in a team. I decided to start Tallyfy in 2014 - Tallyfy is workflow and process management software for teams who want to track and improve repetitive tasks. Tallyfy has won several innovation awards and attracted international attention from the world’s top companies and venture capitalists. Tallyfy is being used across all industries - pharmaceutical companies, universities and nonprofits to track and improve onboarding, implementation and approval processes, so that people can focus on the job they signed up to do. I hope we’ll be helping the NHS very soon! We strongly believe that customer onboarding is a huge problem for businesses, and doing it well leads to customer retention. How City University (and a Nursing BSc) equipped me for success? A student nurse’s university experience is different to most other courses. It’s half theory and half placements, shadowing trained professionals in real-life work environments. I enhanced my critical thinking skills as we were encouraged to ask ‘why’ for everything we did: Why do we monitor vital signs every 4 hours?, Do we really need to?, What is the latest evidence for doing it this way? etc. This ‘why’ tends to disappear after one’s childhood and I got it back, and it’s here to stay! I had practice placements across schools, wards and clinics in a multicultural and mixed socio-economic area. This taught me most valuable skill that I need to apply everyday - ability to communicate and relate to (empathize with) any person or demographic! There was also plenty of opportunities presented to network with the brightest professionals in healthcare and education. I’m so glad I built these relationships, as I followed up with these people later in life to help me validate my idea.